We are all making bread. Something has overcome us. A few months ago, if you were to come up to one of us and ask about bread, you might have gotten a referral for a great local bakery. For some, sure, it's been a year or two of the fever. But for me, for many of my friends, my friends' friends, around Portland and the country and as far away as Canada and Paris and New Zealand, bread is a new passion; we have only recently come to this place where, on a Friday night, all we can think about is bread. We cannot wait to cut open those yeast packets or to open the frothy pot of sourdough starter; we cannot bear to bide a moment longer before dipping our hands in flour, emerging from the kitchen with pale marks on the thighs of our comfortable Friday-night pants. We count our evenings in the time it will take a loaf to mix, rise, bake, setting our own bedtime a little while after we cut that first slice, slathering it with butter and sprinkling with sea salt or perhaps drizzling with spoonfuls of honey. In front of the television or at the kitchen table, in Arkansas and British Columbia, in Kenton and Creston-Kenilworth, we are licking our fingers and rolling our eyes as if we were characters in a sensual novel full of magic and food. 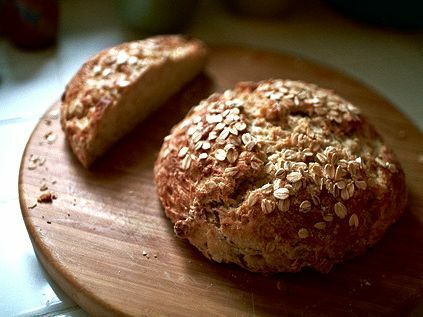 I am making oatmeal bread, two fat round loaves. This is a recipe that has captured nearly every one of my close friends and is virtually impossible to screw up. My nanny has made it in loaf pans, and with molasses; my friend Larissa doesn't like to soak the oatmeal for very long (just 30 minutes, she says, is perfect). We have left out key ingredients, the egg, the butter, we have used less honey or more whole-wheat flour, we have substituted things and added things. It has always been delicious. I am making it tonight with cinnamon, and I am using Bob's Red Mill Organic Extra-Thick Rolled Oats. I am using local wildflower honey and the tiniest square of Crémerie Classique butter, because my other pound has just come out of the freezer and is terrifically hard. I am wondering if I could sprinkle it with cocoa nibs, although that seems a bit much, even for this anything-goes bread. As I type this, waiting for my oats to soak up the proper amount of hot milk, I can taste the bread. I like it toasted, twice for extra crispness, with lots and lots of butter and a generous spoonful of honey. I know how it will be used this weekend, as breakfast and dinner for Everett, my five-year-old, light of my life, picky eater of my soul: sliced thick with glops of sticky honey, he licks the honeyed crumbs off the plate when he's done. I know that, if it is a good week, if we are virtuous and do not go out for coffee-shop cookies and Burgerville fries, I will be making another two loaves on Monday night, too. almost best this way: away. I grasp and hold a different, new kind of connected peace. I am at home tonight, my husband is already sleeping, and I am eating bread.